There's something to be said about small, local races. As I continue to evolve as a runner, I've grown more fond of the small, no-frills races as opposed to the huge, big city runs sponsored by some financial or consulting firm I've never heard of. Logistically, small races are so much easier and a heck of a lot less stressful. No long lines at an expo. Pick up your bib minutes before the race starts. No race t-shirts handed out to add to my piles at home (I really need to stop by a Goodwill). Most importantly, no stampede of runners you find yourself in at the start of a big race. Don't get me wrong, I still run in my fair share of big city races (in fact, one of my favorites is Chicago), I just prefer smaller races. All this to say that the Rosaryville 50K was exactly the kind of race I needed this past weekend. 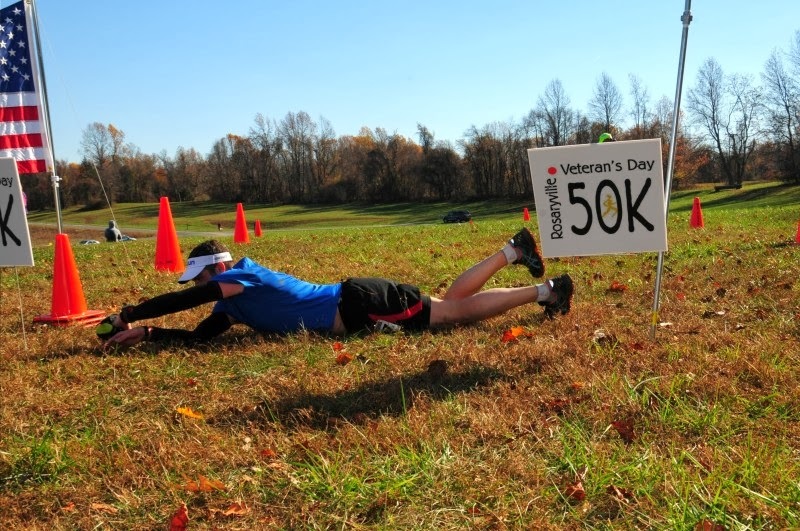 Hosted by Annapolis Striders, the race consisted of running three 10 mile loops around the Perimeter Trail of the Rosaryville State Park in Upper Marlboro, Maryland. The race accepted 200 entries and while it did sell out, only 150 runners or so turned out. It was cold and frosty on race morning, but the sun was shining and runner enthusiasm was high. When the race director asked how many were running their first ultra, quite a few hands popped up. I loved it! Nothing beats running a race knowing many are about to get their first taste of ultra running. 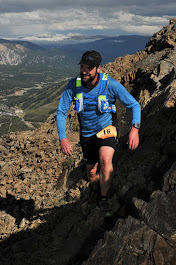 In my opinion, the 50K is the 101 of ultra running. It's a great way to break into the ultra world and you can easily train and prepare for one by following a marathon training program. Anyway, my goal for Rosaryville was to use it as a training run in preparation for my 50 miler next month in San Francisco. After coming off my PR marathon last weekend, there was no need to run this hard. I was happy to run easy, take in the sights and enjoy a morning on the trails. The race got underway without a hitch. However, when I went to start my Garmin, a message popped up saying my keys were locked. Hmmm? You can lock your keys on a Garmin? Since I didn't know how I locked them in the first place, I couldn't figure out how to unlock them. After messing with it for about 5 minutes, I gave up. Running by feel it is! The trail was a flat, non-technical single track. The only difficultly I and other runners faced was trying to spot the roots that the fallen leaves had covered up. And if you're wondering, yes, I fell. Twice. The course had two aid stations, spaced about 5 miles apart. The first aid station had your drop bag, if you chose to leave one. I was definitely glad to have one because as race wore on, the temperatures climbed and a wardrobe change was needed. The first two laps were uneventful for me. But, even running at an easy pace, my post-marathon legs were starting to fire up on my final lap. I didn't mind, though. I like to train on tried legs. It's good practice for how my legs are gonna feel in my 50 miler. However, it was my tired legs that led to my graceful Superman of a fall on the last lap. One second, I'm shuffling along, the next, I'm flat on my back staring at the canopy of trees above. I even had a small audience of runners to show off my impressive Superman skills to. As the finish line came into view, I decided I wanted to roll across the finish. Why? Why not? You can't take running too seriously or you'll begin to hate it. After my graceful roll across the line and a quick pose for the cameraman, I hopped up and was greeted by a smiling volunteer placing a finishers medal around my neck. My time was 5:13:47, which was actually a new 50K PR for me. But, if you compare the difficulty of this course to my previous 50K PR, you'd see why I able shave off some time. Nonetheless, it was a PR run, so I'll take it! My thanks to Annapolis Striders for a fun race! Thanks Elizabeth! It was a fun race! hey man! nice job at Rosaryville. Good to finally meet you in person - funny I didn't realize the connection with DCRR and Elizabeth until just now! Cheers! Nice race for you. Good luck at JFK! Nice! Pretty stellar time for a 50k! So are you running North Face ECS Championships in San Francisco next month? 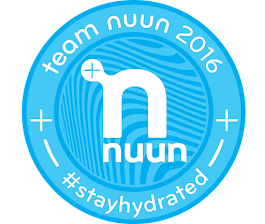 I'll be there doing the 50k and blogging about the race! PS - Mode and up arrow lock/unlock your Garmin...at least on the 310XT. Not sure about different models. Thanks Brett! Yep, I'll be out in San Francisco. Should be a fun weekend!